A marker is one who is appointed by the Committee to record a competitor's score in stroke play. He may be a fellow-competitor. He is not a referee. Q. A plays three holes by himself while his marker, B, rests. B then resumes play and marks A's scores for the holes he (A) played alone as well as his scores for the remainder of the holes. Should A's card be accepted? A. No. A should have insisted on B accompanying him or have discontinued play and reported to the Committee. Since A was not accompanied by a marker for three holes, he did not have an acceptable score. After each hole the marker should check the score with the competitor and record it. On completion of the round, the marker must sign the score card and hand it to the competitor. If more than one marker records the scores, each must sign for the part for which he is responsible. The only other Decision on this subject is 6-6a/4, in which the marker refuses to sign the competitor's card after a dispute over a penalty incurred, which is not really relevant to the subject of this blog. The point to remember is that the Rules require the marker to sign the player’s card so that he has a score that is acceptable for the purposes of the competition. The rules recommend that a marker should check the score with the competitor after each hole although this is not mandatory. Ultimately, this is a game that relies on integrity of the player and the witnessing of every stroke by their marker is not specifically required. If a marker says that they will not sign the card because they could not be sure of the score the player made, or they were not accompanying the player on every stroke, then it becomes an issue that the Committee has to deal with, as to whether the player’s score is acceptable, or not, based on whatever evidence that they can gather. I have one final point on this subject. 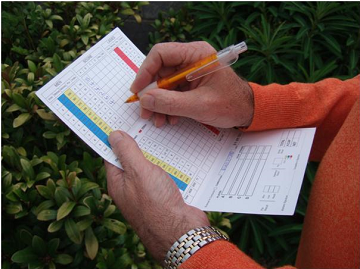 In some playing groups it is common for one person to mark all the scorecards, including their own. This is not an acceptable practice in competitions and must be discouraged. It is a truism that golf brings the best out in a good man and the worst out in a bad man. If any reader who has not yet subscribed to my weekly ‘Rhodes Rules School’ series would like to see an example before subscribing please email me at rules at barryrhodes dot com. However, I would remind you that this weekly series, where I pose several Q&As based around photos of situations that players regularly encounter on the course, is sent without charge and you can unsubscribe at any time. I promise that I will not pass on your email address to anyone else. Click on this link to subscribe. If the committee appoints a marker to walk along with a foursome and record the scores, does the marker also mark penalties, etc. that he observes? What if those penalties are questioned by the player? After each hole the marker should check the score with the competitor and record it. If the competitor gives a score that does not include a penalty that the marker knows was incurred then the marker should notify the player and the score should be agreed. If the player and the marker cannot agree they must obtain a ruling from the Committee before they sign and return the score card. here is my situation, and i doubt there is anything that can be done because in the end I signed the card. At the completion of the second round my "marker" for the round and I compared scores by orally announcing them to each other. I was about 8 feet away standing behind his cart. Our scores were correct and I finished with a 79. What I failed to realize is that this player had a separate scorecard that he kept for the entire foursome, though he was not required to and the scores he read to me were from that card and not from my tournament card. A few minutes later I signed his card then he handed me my tournament card and I saw it was 39 40 for a 79 and signed it. I made the mistake of not checking the scores hole by hole because I thought we had just done that. Turns out he had marked me for a 3 on the 5th hole in which I had a 4. He had forgotten to mark the score for hole #5 and then the following hole #6 was a par 3 in which he then recorded my score for #5 as the 3 I scored on #6 and I guess put a 3 for the #6 after hole 7. I realize now that I should have taken possession of the card and checked each hole myself. I was disqualified after the second round, is there anything I can do to dispute before next weekends final round or do I have to just bite the bullet and learn from this incident. Unfortunately, this is one of those situations that you have to put down to experience. You signed your score card, which did not accurately reflect your gross scores and so you must be disqualified. Rule 6-6b requires that the competitor check the accuracy of their score for each hole before signing their score card and returning it. After resolving 4bbb comp a winning score of net 59 was recorded. This was a men's comp, and the card was marked by respective wife's who joined them but not in the comp? As markers it has been reported that the ladies were putting out before the competitors possibly showing lines of puts? If a competitor plays out of turn, there is no penalty and the ball is played as it lies. If, however, the Committee determines that competitors have agreed to play out of turn to give one of them an advantage, they are disqualified. In my opinion, it does not matter that the ladies were not competitors, the disqualification should stand if the Committee are satisfied that the men were receiving an advantage. Hi Barry, If player B says "Use a longer club" to player A after player A has hit 3 balls into the water, is that advice? By the way, in my case, player A said "I know", but then hit another one into the water. So i guess he didn't really gain much from player B's comment. Does this waive any penalty player B may have incurred? What if player B just said it because he was fed up of player A hitting so many in the water? Such a statement is advice (even when it is bad advice!). The person giving the advice is penalised. There is no penalty for the player who did not ask for the advice, even if he then decides that he will change his club for his next stroke. The fact that any advice given (or asked for) does not help the player with their next stroke does not change the penalty. The person giving the advice cannot avoid the penalty because he was frustrated with the player. Apart from breaching a Rule of Golf they were guilty of poor etiquette. I am not sure what you are getting at here. The penalty wass incurred because a fellow competitor gave advice by saying that a different club should be used to clear the water. It does not matter who heard it, the penalty applies as soon as the remark is made. If two players recognised that a penalty had been incurred by the person giving advice, but agreed that it should not be recorded on their score card, then they are both disqualified for agreeing to waive a Rule of Golf. Ok thanks, what if there wasn't a referee around? What happened was that there was a hold up on a par 3 and so there was two flights on the tee box. I was in the back flight and waiting for the front flight to tee off. I was sitting down when a player from the front flight hit 3 balls into the water. Then, another player said "Use a longer club" I am not sure if anybody else realized that that was considered advice. I didn't say anything. I didn't agree to waive the rule with anybody else, so does that mean that I am not penalized? It does not matter whether there was "a referee around". The player incurred a penalty by offering advice on club selection; anyone could have brought it to their attention and they would have to include the penalty on their score card. Having clarified that, if I had been in your flight, waiting for the group in front, I would probably not have said anything until after the rounds had been completed. The 'advice' was not going to make much difference to the player in question and there was a strong likelihood that any comment by you at the time could have led to friction! You cannot be penalised for agreeing to waive a Rule, if you have said nothing about the breach. But see my blog of September 6th, 2009, 'Every Golfer is a Referee'. Ok, thanks for the clarification Barry! Hi Barry, here is a situation I was faced with yesterday. One of my flight mates' ball was near the cart path. When I first looked at it I didn't think it was a free drop, but I was not sure if there was some of the path that we couldn't see. But I didn't really think it was a drop. So I asked his marker (I wasn't his marker) and he thought it was a drop. So, I asked the player if he thought he would hit the cart path when he swung and he said yes. So, even though I didn't think so, I agreed with his marker and since the player said "yes" to my question, I agreed to give him a drop. I think that you made the correct decision. It is for the player to decide whether there is interference from the immovable obstruction for their intended stroke. Unless it is blatantly obvious that the path would only interfere through use of a clearly unreasonable stroke, or an unnecessarily abnormal stance, swing or direction of play, it is better to give benefit of the doubt to the player. Is there never a situation when it's ok for a partner to putt out of order to enable the other partner to see the line? Yes, if the partner is still in the hole they are entitled to putt out in the order that suits their side best. However, a player may not purposely putt away from the hole to a position on the same line as their partner, so as to assist them in their subsequent line of putt, as this procedure is contrary to the spirit of the game. In four-ball stroke play the action incurs a penalty of two strokes for both players and in match play disqualification from the hole of both players (Decision 30-3f/6). On the responsibilities of a "Marker" theme. Can the committee appointed marker play golf at the same time alongside the competitor, although not actually participate in the competition? Yes, a Committee may authorise anyone to be a marker. Sometimes Committees authorise players in a competition to organise their own marker and this may, or may not include a restriction, e.g. they must be competing in the same competition; they must have an approved handicap; they must not be a junior member. Is it ever acceptable for s couple playing in a foursomes competition to play without an independent marker? No, Rules 6-6b states that a marker or markers must sign the score card before it is returned to the Committee. Decision 6-6a/2 rules that if any holes in a stipulated round are played without a marker the player's score is not acceptable. In exceptional circumstances when no marker can be found the Committee can authorise them to mark their own card. It is stressed that this must be as a last resort and must not be done on a regular basis." I am amazed, as Decision 6-6a/2 specifically rules against a player, or pair, playing any holes without a marker. I suggest that you ask your Committee for a copy of the communication from the R&A and see exactly what it says. I would then be grateful if you could copy it to me at rules at barry rhodes dot com. I have witnessed in stroke play a marker demand, of the player whose card he is marking, that the player not take any relief anywhere on the course without clearing it with the marker first. I can find nowhere in the rules that authorizes a marker to make such a statement. Of course, simple courtesy suggests the player should keep his marker fully informed of his score and other significant actions, but as you touch on in your blog, it would not appear practical to have a marker who is a fellow-competitor watching everything. Personally, I do recommend that players notify their marker before taking relief. But, as you say, the Rules do not require it, they merely require that a marker is present for each hole of the round and that they sign the player's score card, attesting its accuracy. For the record, I did not receive any evidence from 'Anonymous' above that the R&A have ruled that in exceptional circumstances, when no marker can be found, the Committee can authorise them to mark their own card. I am extremely doubtful that this 'ruling' was ever made. I came across this thread as I was trying to check out the accuracy of our treatment in a recent 4BBB open competition. When we arrived we were told that our partners had withdrawn from the competition. We were advised by the Pro that we could still enter the comp and mark our own card. We would be "trusted". In the event we returned a very poor score! However, I wonder what would have happened if our score had put us in the prizes. I assume that the Pro was acting on behalf of the Committee. From the comments above he should probably not have given us permission to play in the comp. However, the fact is that he did! Does this constitute a decision by the Committee that should stand, meaning that the score should stand? I guess the "marking own card" concept applies to every 4man team competition played but maybe these are outwith the rules of golf. The Rules of Golf require that a marker, who is not a member of the side, must witness play of the stipulated round and then sign the competion score card for it to be valid. It is the Committee's responsibility to appoint a marker. The circumstances that you describe are unfortunate and the Professional should not have permitted you to enter you unattested score card. Of course, if you could have found anyone to accompany you for the competition to act as a marker, whether they played or not, the Committee should accept this, as they failed in their responsibility to provide you with a marker. Team competition formats are not contemplated by the Rules of Golf, so the terms under which a score card is accepted should be set down in the Conditions of Competition (e.g. at least two members of the side should sign the score card before it is returned). Thanks for your reply. However, I am still not sure what the situation would be given that the Committee (i.e. the Pro) DID allow us to play and return our score. Would the decision of the Committee to allow us to play stand or should we have been dq'd? The answer was in the first sentence of my previous reply. No marker means disqualification. OK so I guess the idea of a Committee's decision being final doesn't apply in this case. I have been sent the following analysis by a fellow club member. Can you find a flaw in it? A "marker" is one who is appointed by the Committee to record a competitor’s score in stroke play. He may be a fellow-competitor. He is not a referee. A "competitor" is a player in a stroke play competition. A "fellow-competitor" is any person with whom the competitor plays. Neither is partner of the other. In stroke play foursome and four-ball competitions, where the context so admits, the word "competitor" or "fellow-competitor" includes his partner. So a marker may be a fellow-competitor and a fellow-competitor in 4BBB may be a partner. So a marker may be a partner. So if a pair is given an instruction by the committee that each player is the marker for his partner and both players sign the card, there is no problem. I can't find a hole in this but maybe there is something elsewhere in the rules that I'm missing? The flaw in this analysis is the phrase, "where the context so admits, the word "competitor" or "fellow-competitor" includes his partner.". In 4BBB the marker may be a fellow competitor, but not a partner on their side. I can assure you that there is nothing in the Rules, or the Decisions on the Rules, that permit a marker to attest their own side's scores. If your Committee has made a ruling that your unattested score card is acceptable to them, that is their perogative. However, if I was a competitor in the competition I would be objecting to their ruling. Rule 10, Order of Play. Who Plays First?